Congratulations to Jidenna, who just won the best new artist award at the 2015 soul train awards. During his acceptance speech, he credited his father for setting a standard of excellence. "Whenever I go home with a grade of 98 and ask my father to put it up on the fridge, he would respond in his Nigerian accent: ahn ahn, where are the other 2 points? Go and find them first!" Congratulations to our Nigerian brother, and kudos to his father for pushing him to strive for the best. 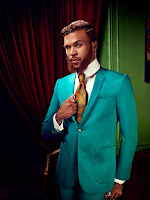 Jidenna is currently signed to wondaland records and is well known for his hit single, Classic man.